Driving down Balmoral or Beverly Streets in Thunder Bay August 16th you may have done a double take. If you looked up to Maplecrest Tower condominium you saw people stepping over the ledge of the 14 storey building and repelling down some 150 feet to the ground. Many of the 40 participants were dressed in super hero costumes and in for the experience of a lifetime! Kathy Otway is the mother of Alannah who went to the camp just outside of Ottawa for the first time this year. “ I went swimming, fishing and made new friends,” said Alanah. 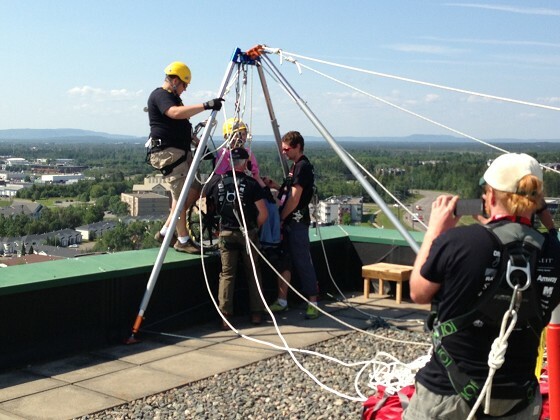 “ Easer Seals flew someone up to Thunder Bay to fly down with Alannah. We meet them at the airport and told them all about her. Alannah didn’t have time to be homesick because they have so many activities, they were so busy.” said Kathy Otway.